Abu Ali Mustafa (/ˈɑːbuː ˈɑːli ˈmuːstəfə/ ( listen); Arabic: أبو علي مصطفى‎; 1938 – 27 August 2001), the kunya of Mustafa Alhaj also known as Mustafa Ali Zibri, was the Secretary General of the Popular Front for the Liberation of Palestine (PFLP) from July 2000 until he was assassinated by Israeli forces in a targeted killing on 27 August 2001. Mustafa was succeeded as Secretary General by Ahmad Saadat, and the PFLP subsequently renamed their armed wing in the Palestinian territories the Abu Ali Mustafa Brigades. Mustafa Zibri was born in 1938, in the northern West Bank town of Arrabah, the son of a farmer. In 1955 he joined the Arab Nationalist Movement (ANM), and two years later was arrested by the Jordanian authorities for his political activities. On his release in 1961, he took charge of the ANM's military operations in the northern West Bank. Following the Israel Defense Forces' capture of the West Bank in the Six-Day War, he left the West Bank and spent 32 years mainly in Damascus and Jordan. Mustafa joined George Habash and other left-wing members of the ANM in establishing the Marxist Popular Front for the Liberation of Palestine in 1967, and became a leading member of the new organisation. He was also a prominent member of the Palestine Liberation Organisation, rising to become a member of its ruling Executive Committee. He was for a long time deputy to Habash's leadership of the PFLP. In September 1999 he returned to the West Bank under a deal struck between Yasser Arafat and Israel's Prime Minister, Ehud Barak. In July 2000 he was elected as the new general secretary of the PFLP after Habash retired. The PFLP is designated a terrorist organisation by Israel and many western states. Israel held Mustafa personally responsible for 10 different car-bomb attacks undertaken by the PFLP during his time as general secretary (in Jerusalem, Or-Yehuda, Yehud, and Haifa) and other shootings. 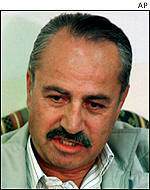 Mustafa was killed by two rockets fired from two Israeli Apache helicopters through his two office windows, as he sat at his desk in his office in Ramallah, in a targeted killing on 27 August 2001. Over 50,000 mourners attended his funeral. He was married with three daughters and two sons. In an interview with Al Jazeera shortly before his death, Mustafa repeated his belief that the Palestinian people have the right to struggle using all means, including the armed struggle. Asked about the risk of targeted killing at Israeli hands he said: "We all are targeted as soon as we begin to be mobilised. We do our best to avoid their guns, but we are living under the brutal Zionist occupation of our lands, and its army is only a few metres away from us. Of course we must be cautious, but we have work to do, and nothing will stop us." Israeli tourist minister Rehavam Ze'evi was subsequently assassinated on 17 October 2001 by PFLP member Hamdi Quran in revenge for Mustafa's killing. Ze'evi had been a strong supporter of Israel carrying out targeted killing of Palestinian militants. ^ "Abu Ali Mustafa". Abu Ali Mustafa. ^ "Who are the Abu Ali Mustafa Brigades?". euronews. 18 November 2014. ^ "Background on the PFLP". MFA. Retrieved 19 October 2010. ^ "Israel kills key Palestinian leader". BBC. 27 August 2001. Retrieved 22 May 2010. ^ Marmari, Hanoch (6 June 2002). "Digging beneath the surface in the Middle East conflict". Haaretz. Retrieved 22 May 2010. ^ Peter Cave (28 August 2001). "Israel assassinates Abu Ali Mustafa". Australian Broadcasting Corporation. Retrieved 22 May 2010. ^ "An Interview With the New Leader of the Popular Front for the Liberation of Palestine, Abu Ali Mustafa". MEMRI. Retrieved 19 October 2010. ^ Suzanne Goldenberg in Jerusalem (18 October 2001). "Zeevi profile". The Guardian. London. Retrieved 19 October 2010. This page was last edited on 28 March 2019, at 20:02 (UTC).